Are you making use of Zimbra and not happy with its working? But because all your important mails are stored in the application and you are unable to leave them and hesitating to replace Zimbra with other program. Then there is no need to worry now as you can easily move from one email application into another without losing any of your essential file. Zimbra is a desktop based popular email program which is known to support multiple user accounts in a single place. It smoothly manages all the contents of mailbox which includes emails, calendars, notes, briefcase, contacts and etc. In spite of having all such features, Zimbra is still losing its demand, why? Because it hasn’t improved when it comes to data synchronization and the long time it takes in responding. Moreover, registering to Zimbra account is one of the major points of users upgrading to MS Outlook as compared to Zimbra Desktop. And the next question which arises after thinking of switching from Zimbra to Outlook is how to import Zimbra TGZ folder into Outlook? But before jumping to how’s part first understand in detail why it becomes necessary to import TGZ to Outlook or migrate Zimbra mailbox to new server like MS Exchange. MS Outlook is also a widely used email application like Zimbra Desktop which is accessible on both Windows OS and Mac OS X as well. It also acts as a personal information manager which manages all the information attached to MS Outlook such as calendar, scheduling, contacts, journal entries and etc. The email application is a standalone program in which Outlook synchronizes well with both i.e MS Exchange and SharePoint Server. Attachment linking to cloud resource. Help featured name “Tell Me”. How to Import Zimbra TGZ Folder into Outlook? Open Zimbra and login using the credentials of account. In the top navigation bar >> choose Preferences. Click Import/Export from the list of Preferences. 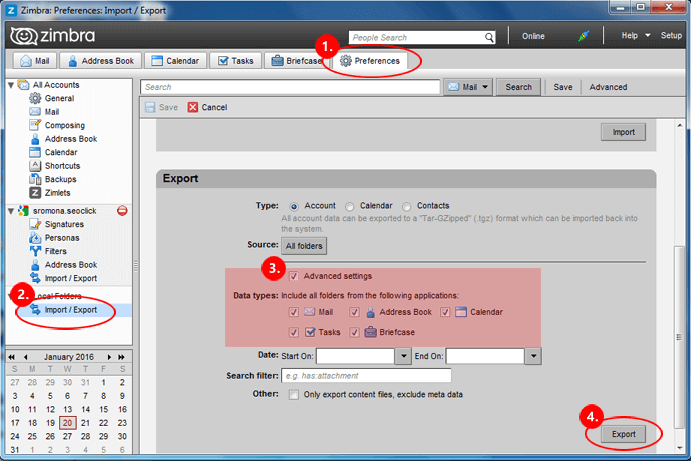 In the Export panel, select the Account type you need to export. Click of Advance Settings Tab, select the items you want to export into TGZ file. Online application will enable to download the mailbox in .tgz format. Extract the downloaded .tgz zip file. Note: After you completed the exporting process, you will get Zip .tgz (TAR zipped) file. You have to unzip the exported .tgz file with the help of WinRAR or any other tool. Launch the software on the system. Click on “Single Mailbox Migration” option and browse the unzipped .tgz folder. Click on “Start Migration” option and choose the required location to save the converted PST file, then the conversion process will start. Understandable and Easy GUI which can be utilized easily by non-technical to implement the migration process. 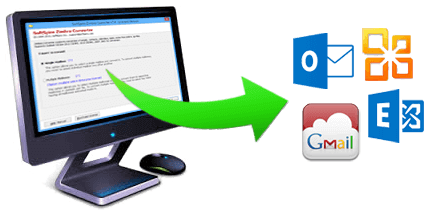 Allow to batch convert Zimbra mailbox to Outlook in single time. Keeps all the email attributes and formatting intact during the process. In-built property which transfer Zimbra mailbox files with attachments. Easy solution to Migrate Zimbra mailbox to new server – MS Exchange, Office 365. Supports all Zimbra desktop versions for conversion with no trouble. The only thing you need to remember that you have to first export .tgz file from Zimbra desktop. No Zimbra installation is required to carry out the import process of Zimbra mailbox to Outlook. Use the free version to understand the working and functionality of the tool. The demo version functions similar to the license edition but includes some limitations, i.e. you are free to convert all the data from Zimbra TGZ to Outlook, but with the embedded “DEMO” watermark. This option is very good to experience the entire environment of the application. So, it is recommended to first try the trial edition and then upgrade to the pro-edition of the software. Day by day Zimbra is losing the market value due to its response time and slow services. Therefore, most of the users are migrating from Zimbra mailbox to Outlook PST file format. Switching from one email client to another is not so easy, users face several challenges in file conversion process. Keeping all these issues of users in mind, Zimbra TGZ Export Tool has been launched which will directly perform the conversion without any data loss. As there is no manual method available to import TGZ to Outlook, so, it is suggested to go with the professional tool i.e. Zimbra TGZ to PST Converter which makes the process more easy and simple for a user to implement. I know advance software to complete Zimbra to Outlook migration process without extraction. If you are looking for a perfect tool for converting your Zimbra TGZ files to multiple file formats such as- PST, PDF, MSG, EML, MBOX, and NSF, then go for Zimbra TGZ Converter. It’s a complete application that provides unified conversion of Zimbra emails, contacts, briefcase, calendars and tasks etc..